Defend the Mournhold Plaza from a Fabricant attack. Loiter, rest, or do something for around 24 hours and then talk to anyone. Travel to the Plaza Brindisi Dorom and help the guards against the machine attack. Talk to any Royal Guard and be directed to Tienius Delitian. Alternate: Report to a High Ordinator and be directed to Fedris Hler in the Temple (skip some Palace quests). Talk to Tienius in the Royal Throne Room and receive the task of investigating the attack. After returning Barilzar's Band to Almalexia, you may be left a little confused over what to do next as neither Drin, nor Fedris, or even Almalexia herself will have anything for you to do. In order to start the next series of events, you will have to wait around a little bit (try resting or waiting for 24 hours). After a time, everyone you speak to will tell you of an attack on the Plaza Brindisi Dorom by strange enchanted machines and you will be asked to help the High Ordinators and Royal Guards. You won't be able to conduct any business at this point since you are forced to quit the dialogue (the good old 'Goodbye') until you investigate the attack. Take a trip to the Plaza which is the Southern section in the city of Mournhold. Once inside you'll find a number of Hulking and Verminous Fabricants attacking High Ordinators and Royal Guards alike. Join the fray and help the guards defeat the metal beasts (the guards seem to do ok, so you can probably just watch, if you want to). Once all the Fabricants have been defeated, you will receive a journal entry to that effect. Speak to any surviving Royal Guard in the area and they will tell you to go and report the attack to Tienius Delitian at the Royal Palace. Tienius can be found in the Royal Palace, upstairs in the Throne Room, though you won't find anyone who will actually give you this information. Once you've found him, he will ask you to look into the disturbance and find their true source. 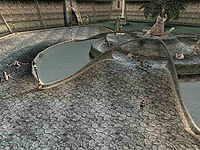 Tienius says that the attacks seem to originate from some Dwemer ruins deep beneath the city. An entrance that may lead to these ruins has been found beneath the Memorial Statue, which was destroyed in the attack on the Plaza. You are to explore the ruins and find out where the creatures originate from. If you speak with a High Ordinator instead, he demands you report immediately to Fedris Hler in the Temple. Hler then asks to investigate the hole opened in the center of plaza (similar to the orders of Tienius Delitian). This will allow you to skip two more palace quests. 10 Strange creatures have burst through the ground at the Plaza Brindisi Dorom, and the High Ordinators and Royal Guard are trying to protect the city. 20 The Royal Guard have asked me to help defend the city against the attacking creatures. 25 The High Ordinators have asked me to help defend the city against the attacking creatures. 30 The creatures attacking the city have been defeated. The plaza is in ruins. 100 The Royal Guard have ordered me to report the attack to Tienius Delitian at the Royal Palace. 105 The High Ordinators have ordered me to report the attack to Fedris Hler at the Temple. 110 Finishes quest I have reported the attack on the city to Tienius Delitian. 115 Finishes quest I have reported the attack on the city to Fedris Hler.